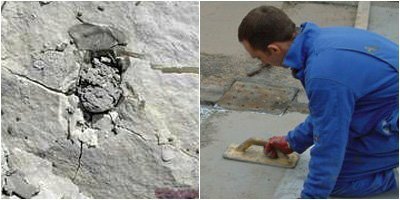 10 Minute Concrete Patch | Repair Holes, Joints & Spalled Areas | Superior Industries, Inc. NOTE: Shipping charges include Hazardous Material Charge. Premier Patch 1000 is an extremely fast curing, high-strength, multi-use polyurea/polyurethane patching material. This 60% solids, two component concrete patch allows for heavy vehicle traffic within minutes after application. Premier Patch 1000 reaches its high compressive strength fast and, thanks to its deep penetrating properties, offers the best possible adhesion to concrete substrates. This easy-to-use product can be applied by onsite maintenance personnel. Premier Patch 1000 meets all USDA guidelines for federally inspected facilities and thus is approved for use in food processing plants. It is also approved for use in pharmaceutical manufacturing and packaging facilities, as well as in buildings utilized by the cosmetic industry. Premier Patch 1000 has a wide application temperature range of 0°F (-17.8°C) to 90°F (32.2C), and because it can be applied in sub-freezing temperatures, you can even use the fastest curing concrete patch inside of a freezer! There are so many potential applications for this product it is hard to describe them all here. 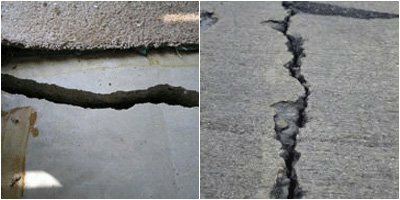 This concrete repair material is suitable for interior use, and is ideal for use in: industrial warehouse facilities, industrial production areas, food processing plants, and more. Premier Patch 1000 is a polyurea urethane combination. 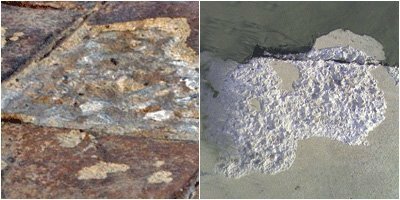 Polyurea, a product developed a couple decades ago, is used for a broad range of applications, including: forming weatherproof truck bed liners, creating anti-corrosion pipe and pipeline coatings, and instantly containing spills on bare soil. Utilizing the most innovative polyurea and urethane technology, Premier Patch 1000 comes out on top as the finest ultra-fast curing concrete repair product. And when we say it’s “the fastest curing concrete patch,” we mean it. This patch dries so fast that it is ready to be walked on in about 5 minutes, and in as little as 10 minutes it can be ready for forklift traffic. This super rapid curing concrete patch has an easy mix ratio of 1:1 and is easy to install. Premier Patch 1000 has a low viscosity and is natural in color. It is VOC compliant and is able to resist most common chemicals. The Blended Method and the Layered Method. 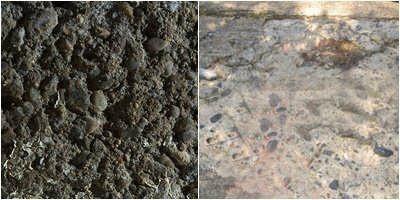 The Blended Method has you mix Parts “A” and “B” (with the simple 1:1 mix ratio) and then incorporate the aggregate into it before applying. This mixing method allows only 5 minutes to get the concrete patch out of the can before it sets up (in other words, it has to be poured out almost instantly). If that time constraint is too limiting, the other application method can be chosen. The Layered Method, an alternative to the Blended Method, has you mix and pour the liquids (Parts “A” and “B”), and then, once applied, distribute aggregate over the entire area until it reaches a dry look. This second method is excellent for applications such as replacing the cap on a concrete floor or filling a crack of a non-moving joint. 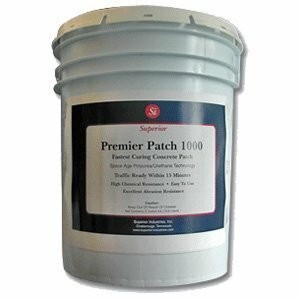 Premier Patch 1000 is available in three different kits sizes, 2 Gallon, 4 Gallon & 8 Gallon. All three kit options include urethane, polyurea, and aggregate; the only difference between the kits is their size. The Premier Patch 30 Kit provides approximately 30 square feet of coverage (at 1/8” thickness). The Premier Patch 100 Kit provides approximately 100 square feet of coverage (at 1/8” thickness). The Premier Patch 400 Kit provides approximately 400 square feet of coverage (at 1/8” thickness). At 75°F (24°C), Premier Patch 1000: has a working time of 2-3 minutes, has a recoat time of 10-15 minutes, is ‘open’ to foot traffic in 5 minutes, and is ‘open’ to vehicle traffic in 10 minutes. Premier Patch 1000 offers a viscosity (mixed) of 20 CPS Typical, a hardness (Shore D) of 70 (ASTM D-2240), and a VOC of 416 g/l (EPA method 24). Its UV resistance is poor (QUV). Because Premier Patch 1000 is the fastest curing concrete patch, we highly recommend that you not mix more product than can be put into place in 5 minutes. See the Tech Data sheet for more thorough application and mixing instructions.